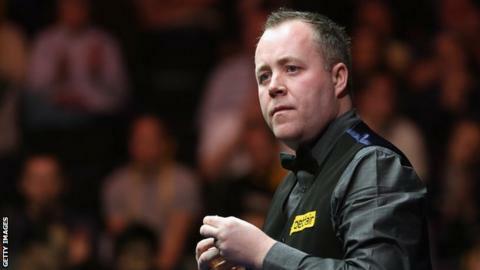 John Higgins took just 75 minutes to whitewash home favourite Ding Junhui 5-0 in the quarter-finals of the Haikou World Open. Ding scored just 14 points in the opening four frames and would ultimately be outscored 523-40. "I didn't really miss any easy shots and when I did miss I got a bit lucky," said four-time winner Higgins. The 37-year-old will now face current champion Mark Allen after the Northern Irishman beat Ricky Walden 5-1. It has been a remarkable upturn in form from the Scot after he won just three matches in total during the last four major tournaments. But he has been in fine form so far in China, dropping just three frames in his three encounters. Matthew Stevens' reward for beating world number one Judd Trump in his quarter-final is a match with Australian Neil Robertson, who enjoyed a 5-3 win over Mark Selby. Stevens, 35, saw off Trump 5-3 to reach the last four - something the Welshman would not have predicted at the start of the tournament after his cue failed to arrive in China. "Before my first match, if you had told me I would get to the semi-finals I would have laughed at you, because it's hard enough winning matches with your own cue," said Stevens. "I can't really believe I'm still here. I've won three matches with three different cues and that must be some sort of record."